So after my last post on my Janome Coverpro Coverstitch machine, I had a few of you ask what serger I own. So I thought, "hey! I need to do a post on sergers and the one I have." It's actually sad that I didn't do a post about it when I got it, but I had some guilt issues that I'm totally over now. Anyway, let's talk sergers, shall we? I am of the opinion that everyone should just go get a serger. Yup. I lived without one for way too long and I was completely in the dark as to how much they cost and how much they really are worth to a garment sewer. Sergers just make life easier and believe me when I tell you, I am not kidding. Since I'm a Thread's Insider (seriously, just go get a membership now!) I have access to all of Louise Cutting's Industry Insider Technique videos - this is totally worth the membership by the way, Louise is a GENIUS! I love her! Anyway, I remember in one of the videos she says something to the effect of how great and easy it is to use a serger and how no sewer should really be without one because the days of finishing seam allowances without one are over. I agree 1,000,000%! I finish seam allowances with my serger nearly 100% of the time now (occasionally I'll do a french seam on linings, but otherwise, I'm a serger girl). So let's talk about what I was never able to seem to find out before I just went out and bought my serger a few years back. You can get a decent serger for fairly inexpensive these days. Mine was a whopping $275. Yup. You can drop your jaw too if you've been thinking that sergers will cost you an arm and a leg and you have to give up your firstborn for one. You can and should be able to purchase a decent serger for something in the $300 - $500 range. My sewing machine was considerably more than that, so when I found out that sergers weren't all that expensive I kept wondering why I had waited so long. Then I went out and purchased the Babylock Lauren. It's the entry level Babylock serger. Now, I'm not going to say that this is the serger for you, but I'm happy with it. It finishes my seam allowances like a champ. Sometimes we have small issues going over bulky areas, but for the most part its fine. Its actually one of the easier ones to thread and I say that having threaded many sergers for students and threaded the ones at Yellow Bird Fabrics a few times. It has a pretty good narrow hem on it that I use from time to time to finish a lining hem. It's got four threads, differential feed and you know, that's pretty much it. With sergers you can get crazy and spend money on a really really nice one (like the Babylocks that thread themselves....sigh....) but the end game is pretty much the same - it finishes your seam allowances so that you can spend your time perfecting other sewing techniques. And when it comes to seam allowances, a serger really really does save you time. The daunting task of finishing seam allowances all of a sudden is not daunting anymore. It reduces time spent doing that to like 1/4 of the time you would spend finishing those silly seam allowances. In fact, I remember the times before I had a serger and I would wander around in a fog just thinking about how long it was going to take me to finish the seam allowances on any garment. Now I don't even think about it. I just do it and its done. So, when I first purchased my serger, immediately after I had done the deed and paid the money, I was reading a certain blog (which I'll not name, but held in very high regard at the time) that went into great detail about how even though they had sergers on their premises that they were "rarely used" because they were totally into finishing their seams the old fashioned way. And it wasn't just one blog post, it was like several blog posts where they kept mentioning that and their sort of "higher ground" for not being in the serger crowd. So then I had instant buyer's remorse for being one of those that invested in a serger and every time I went to serge a seam I would feel instant guilt because I wasn't doing it the "higher ground" way. Friends, this is BOGUS! Look, I totally understand if you don't have the money to invest in a serger right now - I empathize. Just know that there are entry level model sergers that do the job just fine, so maybe you won't have to save up quite as much money as you were thinking. Otherwise, serging just makes life easier. Thank you - I'm a "lower ground" sewer and I'm proud to admit it! What are your thoughts on sergers? Been saving up thinking that sergers are going to cost you thousands of dollars? Are you a "lower ground" sewer? I totally agree that a serger is a miraculous thing. And if the garments you create are the "lower ground" then I'm happy to aspire to that, thank you very much! I absolutely love my serger/overlocker. It's some of the best money I've spent on sewing. It was a third the cost of my sewing machine and I emptied a coin jar to pay for it. Best decision I ever made. Currently I sit on the end of my bed to sew on a shelf - absolutely no room for another appliance! I wish someone would come up with one magical combo machine that could do it all! I bought my serger in 1985, when I was expecting my second child. It's a Singer "something" and I'm sure it cost me much more than $275. After all this time it's still a workhorse! Well, I took a serger class to see how I would like working on a serger. I'm hooked! Right now, I have it on my birthday wishlist, but it would have to be a lower end one because no one is going to give me a $1,000 present! I'm really happy to hear about your serger story actually. I have noticed that sewing blogs tend to share similar opinions and sometimes if you deviate from that opinion you feel like you did something horribly wrong. I became really scared of sewing because I was never sure if I had altered my pattern enough, if I had made enough muslins, etc, all because that is what the sewing world says I should do right now. I often gave up on projects when something small went wrong because I felt like I did it 'wrong'. In the end I stopped making muslins and I stopped caring, and I love sewing again. I sew for myself with my own ideals. So i'm really glad that you made peace with your serger purchase. I like reading all opinions - some people think they don't need sergers, some people do. I'd like to hear both! To be fair, I think everybody has different priorities and preferences when it comes to sewing, and if someone wants to take the extra time to finish seams/hems "the old-fashioned way" because they prefer it over the serged finish look, more power to them (though there's no merit in getting preachy or snobby about it). For myself, I also prefer the clean-finish look over the serged look, but how much time I'm willing to spend to make that happen depends on the quality of the fabric and how excited I am for the finished object. I'm planning out a couple dresses made from Liberty Tana Lawn and you can bet I'm going to clean finish all the seam allowances. But a quick sundress from quilting cotton probably isn't going to get the same treatment. I love my serger. But, I hated the first one I purchased. It was probably just me not threading it correctly but, I never could get a consistent stitch out of it. I didn't spend a lot of money on it and was able to sell it to someone who wanted it -- even after I explained my problems with it. Anyway, I learned my lesson and invested in a better one which I had spent a lot of time reviewing and comparing. I don't know how I lived without it for so long. It's wonderful. I use it all the time for seam finishing and other projects as well. Here! Here! To lower ground sewing! I'm a serger convert and will never go back. I too used to dread the thought of finishing seams and have on several occasions, ended up with sore and bruised fingers from hours of pinking. I absolutely love my serger and use it constantly. Besides using it for finishing all my garments, I can't imagine sewing knits without one. My recent Tiramisu and Pavlova (Cake Patterns) were completed almost exclusively with my serger. It has truly saved me hours of time and I rather like the look of all my nicely pressed and finished seams. Some people are sewing snobs. There is a time and place for everything. I like French seams when they are called for and I have time to sew them. I do have a serger and would be lost without it. Jeans are a perfect example. Who the heck is not sergering the seams on jeans? You do what is right for you and the people claiming to be sewing on "higher ground" are snobs. I love my serger and would heartily recommend it to others. I invested in a Babylock Imagine a year ago and it was worth every penny. It is so easy to thread and change configurations (serge to hem to ruffle). I work outside the home full-time, plus have two young children. The serger has increased the amount of garments I make tremendously. Now, I'm saving up for the Babylock coverstitch machine. love love love my overlocker (I'm a brit!) I did make the mistake of buying a used none-branded one off ebay first, which I could never get to work properly, about a year later I got an unexpected work bonus and splurged on a Brother 4234D, worth every penny! after it arrived I spent a week in sewing isolation and 'OVERLOCKED ALL THE THINGS'. I don't understand some of the sewing snobbery which goes on in the blogosphere, in my opinion there is no 'higher' or 'lower' ground, you find a technique that works for your circumstances, you go with it, along the way you learn new things and re-evaluate your techniques. I spent a fortune on my Brother serger - over 1000 dollars because I love outside the US and EU and the distributors charge ridiculous prices for imported products. But it was worth every penny/cent/Turkish Lira. Since I bought it my speed of completion has increased so much that I simply have not bought any more RTW clothes (except undies). Everything is me-made. I love, love, love it. I notice that all the bloggers with very high output have servers too. And use them. I love my serger, in fact I love it so much I bought second one. They are both entry level Janomes, cheap and simple, but do the job. Threading them is not that difficult, it can look daunting the first time you try it but once you get to know your way around it it's very straight forward. At any rate, I totally agree with you - sergers are fabulous and I think every sewist should have one, or at least have the opportunity to sew on one so they can decide for themselves if that's something they need in their sewing space. And people who poo-poo on serged seam finishes? BOO GO AWAY, YOU WILL PRY MY SERGED EDGES OUT OF MY COLD DEAD HANDS. Party poopers! I can't recommend it highly enough - go on, don't be scared!! I have owned a serger since the eighties. I am on my second serger and I don't know what I would do without it. I use it for finishing seams, making loads of knitwear and many a new mom has recieving blankets that I have finished with the serger. It is well and good if you can finish your seams by hand or with bias tape or any of the couture methods, but I don't have time. I would still be on the first item, LOL. Keep calm and Serge on!! I am just starting to think about looking for a serger, either entry level or second hand. I'm mostly happy about finishing seams with zigzag/pinking combination, though I know a serger would look way more professional, but the real reason is I'd like to get some better results sewing knits. Thanks for reiterating that they don't have to be too expensive! I also have a serger. It is the Brother 1034. I love it! I put aside money every month to save for it. When I had saved enough money, I was so excited to purchase it. It has made a difference in my sewing. Now I am thinking about saving for a coverstitch! I have an old 3-thread serger at home, some kind of Japanese brand (I'm pretty sure it's Toyota.) How much I paid for it-- $0. My mom's friend found it at a garage sale for $10, most likely by someone who thought it was broken or couldn't figure out how to thread it. It's not perfect-- it tends to be finicky when starting a seam, it doesn't cut the fabric, it just has a little guide on the side, and it took me awhile (and much frustration) to figure out that if the needle is ever-so-slightly cocked at an angle it will not sew at all. Id say its about medium difficulty to thread-- tweezers are required but they have a well-labeled diagram right on the machine to show you where everything goes. But you know what, it gets the job done and I'm really glad to have it for as long as I can keep the thing running. This post is very pertinent because I'm working on a garment that I was racking my brain trying to figure out how I'd finish the seams without resorting to my serger (the whole "traditional techniques are better" mantra making me feel guilty) but then finally I realized serging was the best I could do and said screw it and I serged it. And now I don't feel so bad about it! Put me in the cave with the rest of you! I serge and I don't care what anybody thinks. I had a bout of "Couture Police Fright" recently whilst considering serging fine lace and I did and I was right because in the end your are the one making your design decisions, it's your sewing project and it should be finished the way you want. As I did say in the accompanying blog post, if Vuitton can coverstitch an entire collection, I can do what I want. I did splurge and buy a Baby Lock Enlighten and I too didn't blog about it at first because it's an insane amount of hard earned cash, but like Ladybird, it's Baby Love for me too. Thank you so much for this post! So, so much! not just for the serger review but for addressing "the guilt". I have been admiring the beautiful work of a few bloggers who don't own a serger and don't regard it too highly at all...and i haven't bought one because i thought that if they can do that kind of work without one, I should be able to do it, too, right? well nooo, i don't have their experience and/or their time and i don't like my seam finishes. I have now decided that I want a serger but i am almost tempted to splurge on a higher end one because I was raised with the mentality to "buy the very best and take care of it so it lasts for a lifetime" ...and the whole threading thing scares me sooo bad. glad to read all the other comments, it is so helpful to hear all the different experiences/opinions. I have a Babylock that is at least 15 years old and I am intimidated by it, too. I really need to take classes on using this specific model (my local sewing store only offers classes on the Bernina). Thanks for sharing. I have a serger I want to learn to use better. And you are more and more convincing me to get the Threads subscription every time you mention it! Thank you for being a reasonable voice regarding quicker methods. There is probably no reason to make sewing harder and longer than it needs to be. I love my serger, always use it when I can for finishing seams and with knits constructing my entire garment. I like to make garments, many of them and the serger lets me do that quickly with great results. I bought a separate coverstitch machine a few years back and love it, too. Ain't it the truth? There is a kind of snobbery against projects that have been serged. That snobbery started to creep into my mind and I batted it way over the left field fence. My first serger was a teenee, tynee Singer Tiny Serger I got 15 years ago. It's like a toy. I still us it along side my Brother 1034D Serger. Both serve an important purpose. 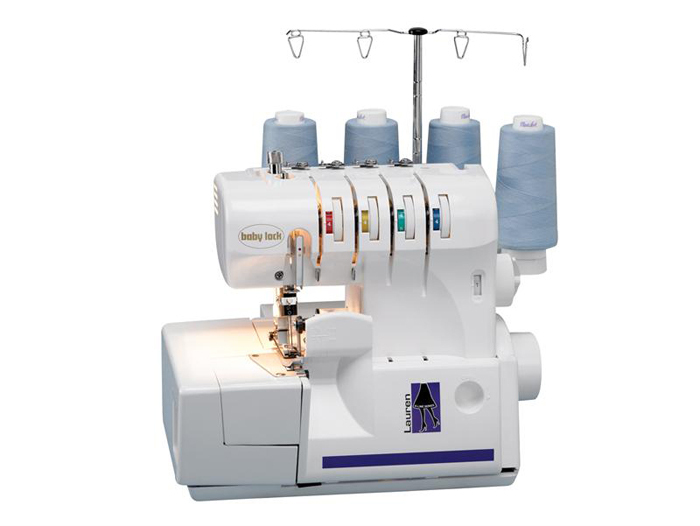 The Singer Tiny Serger for small, delicate serging and the Brother Serger for heavy duty, fast serging. I'm glad to have both. SO silly when people poo poo sergers, they save so much time! I felt guilty about buying one too, so I bought a used Singer for 90 bucks. I even felt guilty about that, but then one day I took it in for a tune up and the guy at the shop was geeking out over how much I paid for it. Let me tell you, I am so happy with the thing and how much time it saves me that I'm considering buying myself a fancy one a few years down the road! I am in the machine-quilting business and think of this serger vs. "higher ground" old-fashioned seam finishing very much like what I have run into with the hand quilting vs. machine quilting saga. I do machine quilting.. it's faster and beautiful. There are traditionalists who say that it's "cheating" to machine quilt and our grandmothers are rolling over in their graves in disappointment. Not me! IF my grandmother had had a machine that would have quilted, you can bet your bottom dollar she would have used it! Yes, there are times that doing a quilt by hand, or finishing seams the traditional way can be useful, but really times change and technology improves and I am all for it! I have 2 sergers. A basic model and a 5-thread one that has the cover-stitch capability. Love, love, love them. Thanks for the serger love. I've never felt shame for our love for each other, my serger and I. I inherited him from my grandmother, and honestly had oogled him since the day she got first brought him home. Granted, he may be a distinguished gentleman from the early 90's, but he still had his vhs instructional video, color coded manual, and tool kit. We've known each other long enough now that I know his threading tricks. Occasionally, I think about trading up for a newer model, but he works, and I can't justify ending our friendship until the bitter end. I just can't imagine sewing without a serger. I'm sort of in between on this one. I own a Brother 1034D too and I almost never use it. Each time it takes me like 30+ minutes to get it set up and adjust all the tensions etc when in most cases i could have felled or frenched a seam in much less time. I think the source of the serger snobbery comes from RTW garments/fashion industry types. If you are looking at a RTW garment with no serging it is generally perceived to be higher quality since serging saves time/money in production. If you go to a high end store it is hard to find much serging. Now go to Old Navy or H&M and every seam in there is serged. For home sewing I agree its more about making yourself happy with each project. If serging a seam makes you happy about your project then go for it! That's what its all about right? I love this post! I bought my overlocker for my 21st birthday and it is still going strong over 15 years later. It was a bottom of the line Bernette but still holds its price. I am looking to upgrade as I want a few more features (self threading is a must) but I couldn't imagine sewing without one these days. I am surprised to hear that anyone would 'serger-shame' anyone! Who cares how you finish the inside of your seams? Sewing is all about doing what works for you. If you're crunched for time, serging is where it's at. Even if you aren't crunched for time but like serging, do it! Life is too short to worry about how you're finishing your seams and if the imaginary sewing gods are going to strike you down for not choosing the most labour intensive method. I'll post about other seam finishes not because I hate sergers, but because not everyone has one and/or has the space and money to buy one, and I don't want beginners to feel that they have to rush out and buy all the things just to learn to sew. So I suppose I am a lower-ground sewer too? If loving my serger is wrong I don't want to be right! I LOVE my serger. Honestly, I'm still a little afraid of it, but really, it's either serging my seams.. or no finishing at all. I'm amazed by how much cleaner it is inside. When I worked in a costume shop and had access to sergers, I was converted. Good to know that home models are affordable, in case someday I have space to store one. couldn't do without my serger! i divide my sewing life into "pre-serger" and "post-serger" because it made that much of a difference to me. i see the serger shaming occasionally and it's nice to see you preaching that serging is not a lesser finish. i like slower hand finishes as much as the next person, but it's just not realistic to do it all the time. I love my overlocker too (British English in Australia!). I was a bit worried to hear May Martin, one of the judges on the great British sewing bee say that overlocking edges before sewing the garment together could stretch the fabric. She was talking about a loose weave woven Sandra was making into a jacket, just the sort of fabric you would be tempted to overlock as soon as you cut it out, because it frays a lot. The collar on Sandras jacket was a bit out of shape. Anyone else hear May say this and agree with her? I've not noticed stretching when I've done this myself , but I haven't overlocked a really loose weave woven before that wasn't already underlined. I don't have a serger ... yet. But I've been using the overlocking stitch on my sewing machine. It's not as pretty as a serger of course. All I need to do is change my foot and it's a bonus when my thread colour already matches the fabric! Lord, I love my serger (and I did pay a bomb for it). I'd have been just as happy to pay less. Alas, the one I really wanted (which really does work as well as they say) cost a fortune. But, since your last post, now I'm all into get a cover stitch machine. Do those come at ground level prices?? Or does one need to spend a lot to get a decent one, given how "niche" they are? Wow, that's a lot of overlocker-love! I prefer vintage style and to me, serging just spoils the effect you are trying to emulate. Home sewers have only had access to domestic sergers since, what, the 60s? That's a couple of hundred years in which we coped without them. So, I'm happy with my pinking shears, and the odd french seam or zigzag edge when necessary. I went to a beginner sewing class a few years ago and the teacher was telling the students about overlockers - these were people who were just beginning and hardly knew yet if sewing was for them. So the fact that she didn't even offer pinking shears as a quick and cheap alternative irked me. You don't always need a super-sophisticated machine to do something. Its like chopping an onion in a blender when a knife does the same job. And isn't it a massive waste of thread? I have the same entry-level Brother serger everyone has (1034D) and I'm still learning how to use it. It's hard to get the tension right! But I love having nicely finished seams, and even having to fight the machine a bit it saves me time. And if you live in a large city, cruise Craigslist for a few weeks before you give up and pay retail-- I found mine for $50 in pretty OK condition (a bit scratched up, but working well) and I see them listed for ~$100 all the time. I'd say $50-$100 to experiment with a machine is well worth it for those of us pinching our pennies. I bought a Juki decades ago and still use it today. It's a bit complicated so I only use two of the four threads and don't adjust anything -- I just change the thread to match my fabric. Even my son uses it when he hems his own trousers! I have one, which I use occasionally. My main question is does everyone colour match thread? And if so, how do you justify the cost or how do you make it cost less? I have grey, cream and brown cones of overlocker thread which is fine, but if I wanted to match the colour I'd have to buy ordinary thread (x4) which would get used up so quickly. I waited a long time before I bought my first serger. It was a mid-range Janome 634 D, have had it for 20 years, works like a dear. I still use it. A couple years ago I went for the big dog Bernina. What an amazing machine! It is also a cover stitch machine. (I have not used that function yet, sadly, way too much work to set up!!) So the take-away here is buy the serger. Prices now are more reasonable. Buy a separate cover-stitch machine. While the new machine does an absolutely perfect stitch, every time, way too much money to include the cover-stitch function. I am also a Threads Insider. Sunni is right. A great platform for information and tutorials. Go there, I think it only costs $12.95 per year. I am one of those people who prefer couture techniques and finish most of my garments with French seams. I had been planning on buying a Janome serger when I was gifted a brother just last week. My MIL snowed me how to use it this past weekend and I truly see it as being a time save. I will use it for knits and finishing seems on casual clothes, and save my French seams and bias tape for my silks and special clothes. I have a Husqvarna 936 and love it. It is a top end machine and I can do 3/4/5 thread serging and cover stitch. I haven't done the 5 thread or cover stitch yet but plan on it. I made piping using the serger and that was interesting. Though I will never stop using my serger as it is perfect for finishing seams, I plan on making a shirt for DH without using the serger at all. Just for the fun of it. I have to say, don't be afraid of a serger. Play with it and, if possible, get a couple of lessons on how to use it. I took a two day course and learned a lot. I feel like I wrote this post! I love my serger, I hated seam-allowance finishing before it, and it really is dead useful and easy! Thanks for the serger info, I toy with the idea of buying one. I have a serger that I inherited from my sister-in-law. It doesn't have differential feed, but it finishes seams just fine and I use it often. The thing bout seam finishing is that I used to not do it at all! I have been sewing for years (learned in the late 60s) and I never finished seams on anything except the fanciest or raveliest fabrics. Never. I think the need for finishing all seams is over-rated. It is nice to do, but not necessary. I guess that puts me in the lower than low-ground camp on seam finishing! I forked over money for a Bernina. I wish now I had bought a cheaper brand because I couldn't afford to take the Bernina serging classes. I also think a lower priced model would have finished the seams just as well. I'm of mixed feelings about sergers (although not morally, psht, just personally). Years ago one was gifted to me, and it gave me nothing but trouble. Eventually it was so infuriating with tension problems and wavey stitching and everything that I passed it on, and have never regretted it. However, I think it was rather low end, and maybe a better brand would handle more nicely. Since I have started working with knits more frequently it sometimes seems like a good idea to give them another try, especially if I got one with coverstitch functionality, but my sewing machine WILL work for these things. And while there is certainly nothing wrong with serging raw edges, I genuinly enjoy using seam binding (that's weird, isn't it? I just love the lines of pretty colours inside of my clothing, and find it very satisfying to make everthing smooth and clean). I am relatively new to sewing (1 1/2 years) and recently I started sewing with knits. I don't own a serger, although I found myself browsing over serger models at Amazon and other sites (mostly low-end). I am not sure whether it is a true need justified by the level my sewing (both from a quantity and a quality point of view) or just a supurflouous "luxury" item that will not even be used so often. So, yes, there is some guilt issue here! Mostly I finish my seams with a zig-zag stitch and I occasionally use a fancier method for more "special" garments. This discussion is very informative, it makes me reconsider my reservations about getting one. Thank you for this posting. I too love my serger and wouldn't sew without it. But I don't make historically accurate or vintage clothes. I make stuff I like to wear. It's a choice whether you need/want a serger. I bought mine in the mid 90s while at FIT and it still works great today (Bernette 04D I think) so I've got my money's worth. I love my serger, it's a Juki and on the low end scheme of things. But I'll be darn if I can figure out how to thread the stretchy wooly threads that are so cool. Do you have any tips or suggestions? Since I am a pro-seemstres I always use the serger! Straight stitch and serger are usualy the only two machines used on woven fabrics (exept for specialls like buttonwholers and trensing). For stretch its sergers and flatlock/coverstitch machines. The old fashion pro way of doing it is by french seem or handmade heming, there are ways of heming on straight stitch machines also but it only works on a few fabrictypes. Finishing seams properly is just sewing snobbery! An overlocker (my family wouldn't know what a serger was, they barely understand an overlocker!) is top of my present wish list for my just around the corner big birthday. I can't wait. Many of us aspire to sew garments that are as good as, or better than, ready-to-wear. Why, then, would we not want to use a serger to finish seams? Why would you not choose the most efficient, tidy way to keep your garment from raveling itself into nothing in the wash? Pinking is fine, binding is fine, zig-zagging is fine, turning under is fine, French seams are fine, felled seams are fine, raw edges can be fine. Not every application is right for every garment. If you construct all your clothing completely by hand, then it is indeed "proper" to finish all your seam edges by hand. I've taken a beginner serger course and have been trying to use my serger as much as I can to finish garments. However, my greatest challenge is not operating the serger itself, but figuring out how to serge all my seams. Serge before sewing? When I do this, I have trouble keeping the proper seam allowances (probably because I am not the straightest at serging! ), plus my serger seems to reject single layer fabric. Serge together after? This seems to be okay on some stuff where the bulk doesn't impact but I'm sure it isn't the right path for all materials, even though my serger prefers it! Serge each on its own after? Again, the single layer issue, plus sometimes weird shapes (like I have a pocket in a skirt right now where the pocket layers were sewn to skirt front and back and THEN the pocket assembled - no idea how to finish that curve. Or around zippers. Etc. Have you ever considered doing a tutorial on how to finish a garment by serging? I for one would be your captive audience :) Thanks for the great post! I am 100% with you on sergers! They are time-saving, they make the insides of garments look professional and like you say, they aren't all that expensive. I also read about hand-finishing seams and how much less bulk there is, blah blah blah. I love it that people enjoy a variety of techniques and all that. BUT I am a speed sewer. I want to sew up my TNT's and clothe my body so I have plenty of time for more creative projects. LOVE MY SERGER. Oh and a word on the coverhem machine. I bought one of those, too, back when it was all the rage on the blogosphere. I used it a lot and it was great and all that, BUT, totally not necessary. I sold it (at least those Babylocks hold their value!) and now I just use a twin needle when I want to sew that type of hem. More often I will sew a catch stitch hem by hand. It doesn't take long and it gives me an invisible hem. Voila - now my knit tops aren't as sporty-looking and a little better for office wear. SewingElle, I saw that on the Great British Sewing Bee and I was surprised, I mean SURPRISED at the whole thing. First of all, if you have differential feed on your serger (and most do now) it is a matter of making a quick test on scrap fabric to adjust the differential feed so it won't stretch out the edges of the fabric. Second - an advanced seamstress should have encountered many fabrics and learned that when a fabric seems to be stretching, GO BACK AND COMPARE EACH PIECE TO THE PATTERN PIECE before you sew it up. Don't just leave it to chance for heavens sake! And thirdly (I am sure I could go one, haha) the contestants selected the fabrics and patterns themselves and had a chance to practice before the competition. I am almost certain I heard them say so. SO why didn't Sandra pick a more stable fabric? i was so disappointed on her behalf because she has crazy great skills and she just made a tactical error. consider what kind of wear and tear your clothes will sustain. I'm a serger and I'm proud! Well actually I'm an overlocker as we Brits call it :) I love the ability to quickly and neatly finish seams that will never fray with constant washing, AND you get to quickly stitch stretch fabrics with no fuss and you can play with that lovely bound hem that enables you to get a cute lettuce edge with ease. I was lucky enough to purchase one on eBay for only £50 (about $70) from a lady who'd worked in the industry for years and even gave me a cup of tea and a free tutorial - I couldn't have wished for better. Threading is indeed easy once you get the hang of it.